It was the fall of 1985. Transplanted Cleveland Browns fans throughout Southern California had tired of hoping their beloved Browns’ football game for that weekend would be shown on local television. And if the game was not one of the few games shown in the Southland, they watched the game that was presented hoping for a brief twenty second highlight of the orange and brown during a commercial break. It was then that eight former Clevelanders, who had found each other over the years decided to join together in a small Santa Monica apartment to call a friend in Cleveland who would hold the phone to the radio so they could listen to the broadcast of the game. Afterwards, they split the $34 cost of the call, but they had been able to hear live, their Cleveland Browns football! The following week, they convinced a local restaurant/bar in Santa Monica to show the Browns game via satellite and a crowd of 20 or so Browns fans viewed the game from that locale. Word of mouth spread and Jeff Wagner took it upon himself to write a newsletter and distribute it to the members in attendance. As well, Wagner solicited mailing lists for Southern California from Cleveland publications such as Browns News Illustrated and Cleveland Magazine. That was the beginning of a historic successful phenomenon and the advent of the Southern California Browns Backers Association (SCBBA). By the end of that 1985 season over 200 Cleveland fans packed Apples Restaurant in Santa Monica and two other venues, Via Maria in Cypress and the Stovepiper in Northridge. What followed was a story too “Hollywood” to believe. Within five years, the Southern California Browns Backers Association had established itself as a non-profit corporation and became the largest such sports support group in the country with over 2,500 dues paying members, 27 viewing sites from San Diego to Santa Barbara and became known for its charitable contributions assisting such entities as the Cleveland Heart Association, Jim Brown’s Ameri-Can organization and many others. Annual banquets over the years have included speakers in our Southern California home such as Art Modell, Gib Shanley, Jim Brown, Bob Golic, Hanford Dixon, Frank Minnifield, Felix Wright, Bill Belichick, Eric Turner, Bernie Kosar and more. 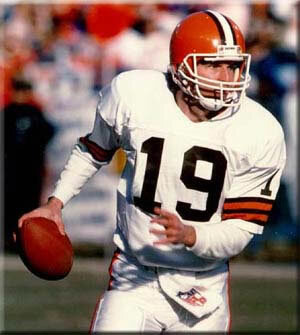 And of course, all of this coincided with the great run of the Browns through the ‘80s and the ‘90s with Bernie Kosar and his teammates. Despite the technological advances including DirecTV, NFL television in your homes and the internet, the SCBBA still exists and looks forward to having you join its membership!